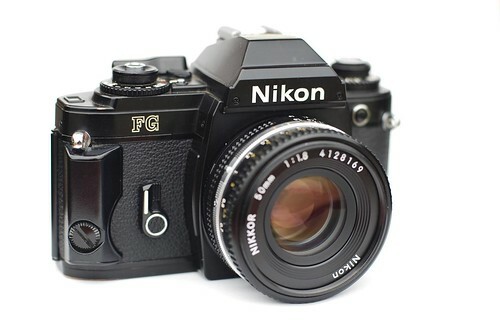 The Nikon FG is a 35mm SLR, made by Nippon Kōgaku from 1982 to 1984. It features 3 exposure modes: Program, Aperture Priority and full Manual. The FG was the first Nikon camera to offer a Program exposure mode. It is also probably the smallest full-featured 35 mm SLR ever manufactured by Nikon. The camera was manufactured in black or silver finish. It replaced the Nikon EM as the company's compact offering, at the bottom of its SLR range, and it was in turn replaced by the Nikon FG20. The "A" setting is for Auto aperture-priority exposure mode. "P" is Program mode, where the camera's microcomputer selects both the aperture and shutter speed for any strength of lighting. The lens should be set to f/11 or the smallest possible aperture to fully exploit this mode. A blinking viewfinder LED alerts the user to select the smallest aperture - if they have failed to do so. The third option is Manual mode, in which the meter remains active but the user can select any combination of shutter speeds and lens apertures. The viewfinder shows times from 1 sec. to 1/1000 of a second on the right side, which are indicated by red LEDs. The maximum flash sync speed is 1/90th of a second. This particular speed is mechanically controlled and can still be used if the battery fails. In "A" and "P" modes, shutter speeds are step-less. The aperture value is not shown in the viewfinder, unlike in the Nikon FM and Nikon FE series cameras. Like the Nikon EM, the Nikon FG has a beeper, which warns of long exposures. It can be disabled with a switch on top of the camera. This camera doesn't have an off switch (it does not draw energy when set to "B"), unlike the Nikon FM-series or Nikon FE-series, plus the film advance lever doesn't not have to be pulled out for the camera to operate without a motor attached. Exposure compensation is possible for up to +/- 2 f-stops in 1/2 steps via the wheel on the left side of the camera top. In addition, there is a button on the left side of the camera front, as found on the EM, which enables an exposure compensation of +2 EV when pushing it. In P mode the adjustment is one stop on the shutter speed and one on the aperture. in A mode the adjustment is two stops on the shutter speed. The FG features TTL/OTF flash capability, via a SPD cell at the base of the Mirror Box, which faces backward and measures light reflected from the film plane. The camera can use Nikon Ai and AiS lenses, as well as early autofocus lenses in manual focus mode. The Nikon G-series lenses are not compatible. Two motor winders could be attached to the Nikon FG, the Nikon MD-E, which was originally developed for the Nikon EM and the Nikon MD-14, which was slightly bigger than the diminutive MD-E, but supported speeds up to 3.5 images per second. The Nikon FG has almost all of the features of the Nikon FE2, in a smaller package. Users looking for a small camera with Nikon F mount and TTL OTF flash cabability will not be disappointed with this camera. While most camera repair shops can no longer repair this camera, many specimens in excellent condition can still be found in the used camera market at modest prices. In terms of features, the Nikon FG is very similar to the Nikon N2000 (F301) when a motor winder is attached. This page was last edited on 16 December 2016, at 11:58.